NFL MVP: Khalil Mack, OLB, Chicago. The fact that Mack is getting no run for this award is insane to me. The Bears only lost four games this season. Two of those losses came when Mack attempted to play with injury (Miami, New England). His “value” is definable. Without him, the Bears are 8-8 at best. Offensive Player of the Year: Patrick Mahomes, QB, Kansas City. 50 touchdowns and 5,000 yards. Mahomes is quite simply the most exciting offensive talent to enter the NFL in a long, long time. And in Andy Reid, he’s found the perfect coach to complement his ability. Defensive Player of the Year: Aaron Donald, DT, Los Angeles. To get 20 sacks from the interior of the defensive line is borderline unthinkable. This is the production award and Donald’s production edges Mack. Assistant Coach of the Year: Don “Wink” Martindale, DC, Baltimore. 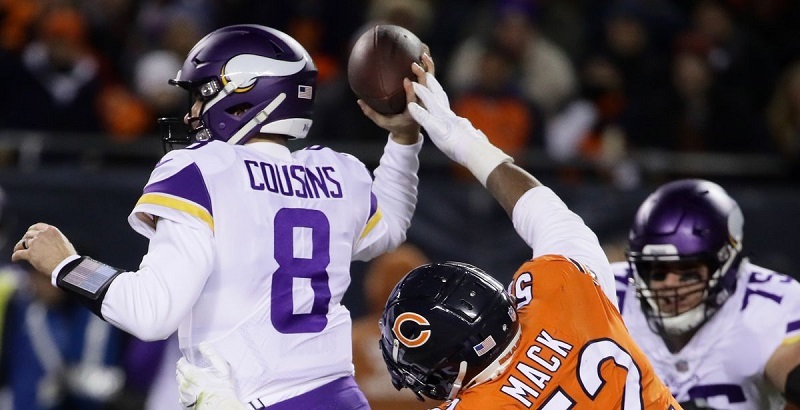 I go Wink over Vic for one reason: that Ravens defense doesn’t have anywhere near the talent the Bears have. Wink has made them one of the league’s best units and statistically the best defense. Executive of the Year: Ryan Pace, GM, Chicago. Khalil Mack. Offensive Rookie of the Year: Saquon Barkley, RB, New York Giants. If this were rookie MVP, I’d take Baker Mayfield. But Barkley is going to have 2,000 yards from scrimmage as a rookie. His numbers have faded a bit lately with Odell Beckham’s injury but this is the kind of rookie production that deserves reward. Defensive Rookie of the Year: Roquan Smith, ILB, Chicago. Yes, Darius Leonard has been terrific. So have Derwin James and Bradley Chubb. But Smith’s season in Chicago is one of the most underrated in the league. He’s anchored the sport’s top rush defense while flying sideline-to-sideline in a way the Bears haven’t seen since Brian Urlacher. This is a homer pick. No question about it. Nobody is giving Roquan this award if you don’t watch him play every week. Well I do. And he wins. Here’s hoping the Colts beat the Titans Sunday night because nobody wants to see Blaine Gabbert on the road in the playoffs. John Dorsey has a tough task in Cleveland. The smart move is to keep the current coaching staff in place but that means convincing offensive coordinator Freddie Kitchens from leaving for a head coaching gig. Many have suggested making Kitchens the head coach but I think that would be a mistake. See: Koetter, Dirk. Predictions for wildcard weekend, based on home teams. Houston Saturday afternoon. Chicago Saturday night. Baltimore/Pittsburgh early Sunday. Dallas late Sunday. $100 four-team, money line parlay: Steelers, Rams, Chiefs, Eagles. Pays out at about 2-1. $10 long shot bet: Jets money line & over 46.5.